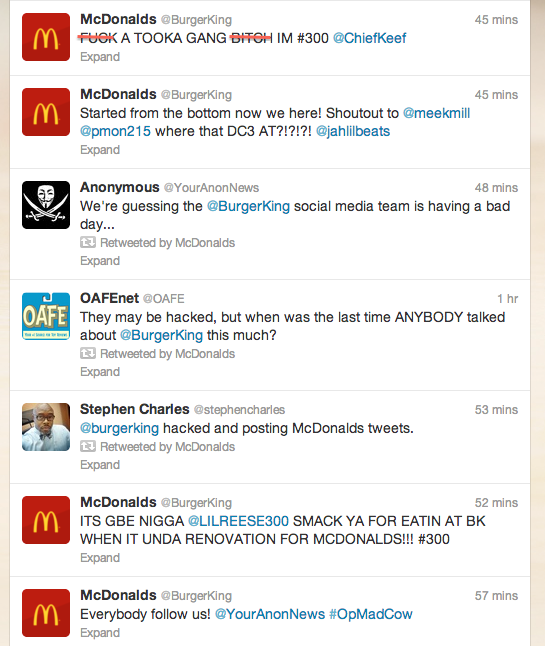 More than two hours after the first unauthorized tweet went live, @BurgerKing remained in the hacker’s hands. Twitter suspended the account at about 1:15pm ET, but not before the perpetrators managed to send out a flurry of offensive tweets, which were quickly retweeted thousands of times. 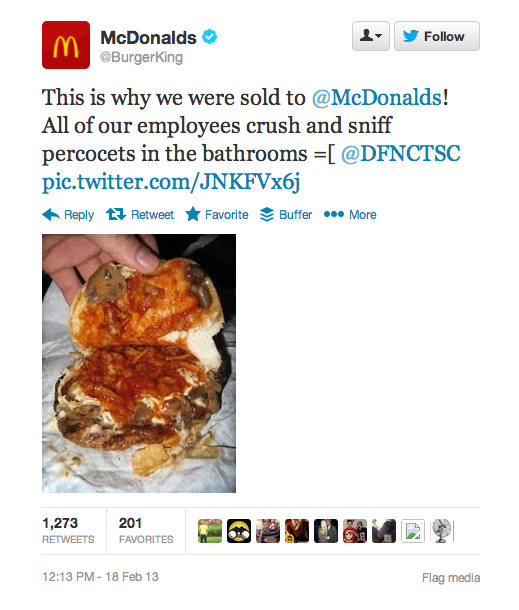 More than 20,000 people started following @BurgerKing while it was under the hackers’ control. The perpetrator of the @BurgerKing account hijacking repeatedly called out @DFNCTSC, or the Defonic Team Screen Name Club, a group of hackers that broke into Paris Hilton’s Sidekick back in 2005 and released her racy photos onto the Web. One member of the group, a 17-year-old from Massachusetts, pled guilty to the hack in September 2005. At one point, the hackers asked users to “follow us” with links to massively popular Anonymous Twitter account @YourAnonNews. A later tweet from @YourAnonNews stated that “the King has been dethroned.” So far, that’s the closest thing we have to an admission that @YourAnonNews was involved in the hack. It is also not yet clear who is in charge of Burger King’s Twitter account. The company has an internal media department. Another company, Coyne PR, also provides public relations services for Burger King. We have reached out to both Burger King and Coyne about the incident, but have not yet heard a response.